I covered all our tables with rainbow and unicorn wrapping paper which was inexpensive and looked great. 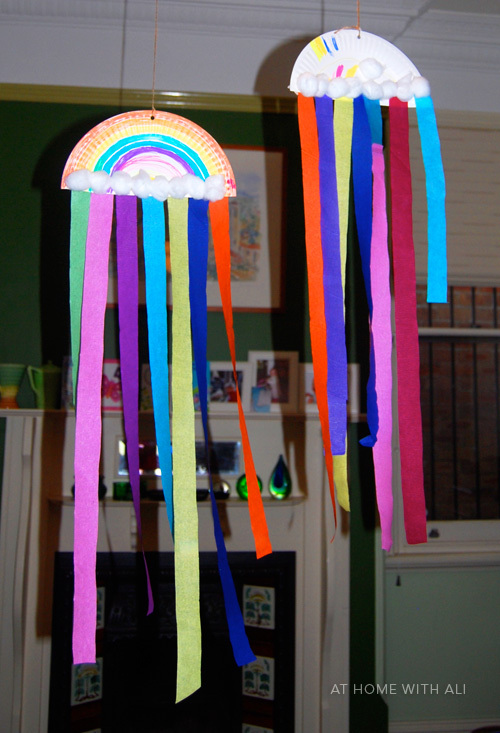 On one table I set up a craft area to make flying rainbows with streamers which I saw on a pretty cool life. 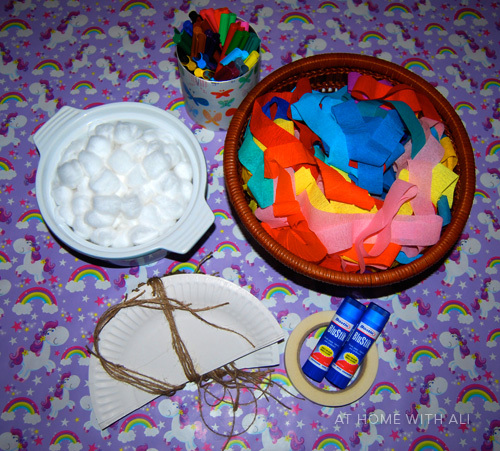 This was a simple, non-messy activity that was easy to pre-prepare before the party. I supplied paper plates cut in half with pre-cut streamers, markers, cotton wool balls for clouds, markers, glue sticks and sticky tape. Cakey and I had made prototypes before the party to hang over the table. There were lots of toddlers attending the party so I also set up a rainbow playdough table with coloured paddle pop sticks and drink umbrellas. I made six batches of playdough (red, orange, yellow, green, blue and purple) during the week before the party. I use an easy no-cook playdough recipe so it didn't take too long (2 cups of plain flour, half cup of salt, 2 tablespoons of vegetable oil, 2 tablespoons of cream of tartar, approximately 1 and a quarter cups of boiling water with food colouring added to the water). 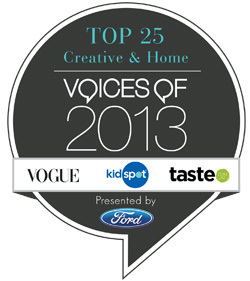 This was a popular table! 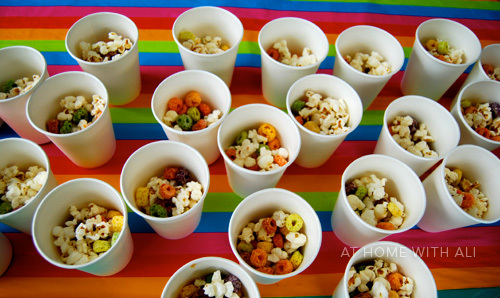 There was lots of rainbow inspired food too – a huge platter of rainbow coloured fruit as well as paper cups full of popcorn mixed with coloured fruit loops (cheerios). I am not capable of baking a super-fancy cake but I can decorate with the best of them! 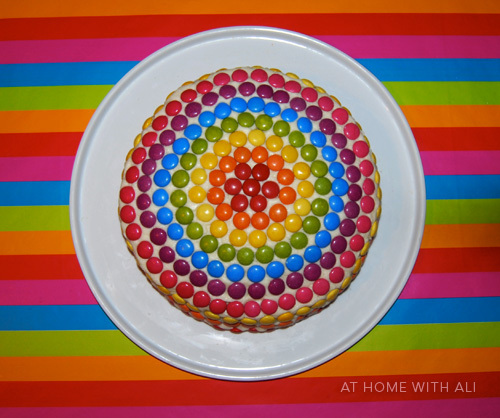 I made a plain vanilla cake, iced it with butter cream icing and carefully decorated it with coloured chocolate smarties in concentric rings. 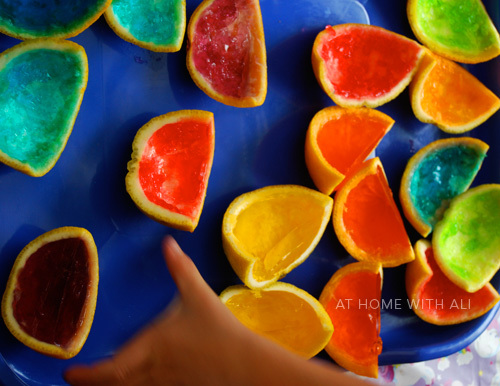 And of course, we served rainbow orange jellies. The kids pounced on them. To make orange jellies, slice oranges in half and scoop out the flesh. Prepare jelly as per the packet instructions and allow to cool for 20 minutes. Pour the jelly into the empty orange halves and place in the fridge until set. Before serving cut the orange halves into quarters. Kids love them. 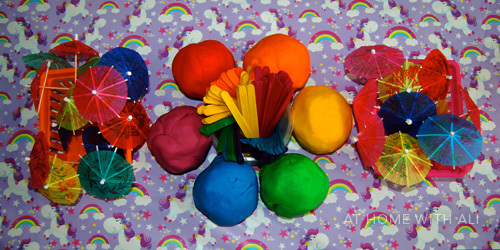 The kids and I made our own rainbow party bags, have at a look at this post to see how they turned out. 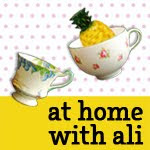 For tonnes of other party ideas check out my party, party, party Pinterest board. You just can't beat a rainbow!!! AAH, I love that cake. And Happy Birthday to your little girl too! What a beautiful party!! I bet Cakey loved it! So many fun activities! Also, wanted to let you know I featured your Mud Garden in The Outdoor Play Party this week at The Golden Gleam. What a fantastic array of decorations. I love the streamers from the rainbow. I love how gender neutral rainbow parties are. Happy Birthday to your darling. Thanks for posting on The Kids' Weekly Coop! So fun! I just did a rainbow party too, so it's fun to compare. You had great ideas! Covering the table with wrapping paper is a good idea actually. Love th cake! How fun!! Such a great theme. Thank you for sharing at Sharing Saturday!! I hope you are having an amazing week! !